I don’t do a whole lot of shopping inside the park since I’m generally not buying souvenirs much and the things I do tend to buy (like ears) I find either at the Mad Hatter or general merchandise stores like the Emporium. So needless to say, I’m not sure I’ve ever actually been inside the Indiana Jones Adventure Outpost before now. Well, “now” as in when I took these pictures a few weeks ago, but you know what I mean. 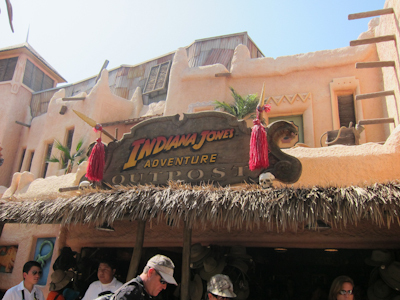 Anyway, the Indiana Jones Adventure Outpost store is located (shockingly) across the way from the Indiana Jones Adventure ride. 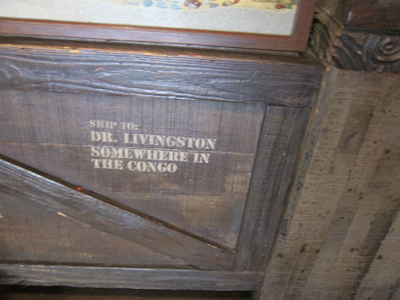 It’s right in the bottleneck area of Adventureland, which is another reason I’ve never gone in–I’m just trying to get through the bottleneck in Adventureland. Although there is one advantage of being on such a slow-moving pathway, which is that it’s extremely easy to catch shoplifters. It’s not like they’re going anywhere fast. The Outpost is easily identified by its stylish straight-out-of-the-80s Indiana Jones logo accompanied by two fake miniature skulls. Except the fake apartments don’t really look very Indiana Jones Adventure-y. They’re kind of more like–yeah, I don’t know. Forget it. 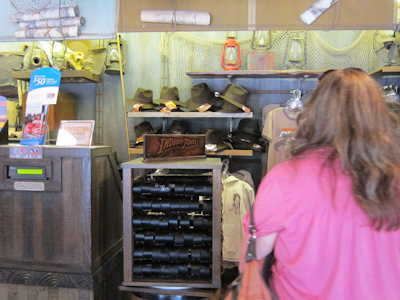 The big theme in the Outpost is Indy’s trademark hat. "Excuse me, do you know where I can find an Indy hat?" Indy’s fedora is positively iconic. I didn’t check to see how much they were, but I’m pretty sure they’re less than the $99.99 that ThinkGeek is charging for theirs. Although ThinkGeek attempts to lay out a pretty compelling argument for their $99.99 hat by saying that there were 3 (or more) hats used by Indy, but the fur felt one was the stylish one used for closeups and non-action scenes, and while other Indy hats are wool felt, the $99.99 hat is fur felt. I’m not sure exactly what fur felt is, but it must be costly. Anyway, I love ThinkGeek so I will forgive them for this. I mean, they have an entire category for Zombies and Bacon. What’s there not to love about that? 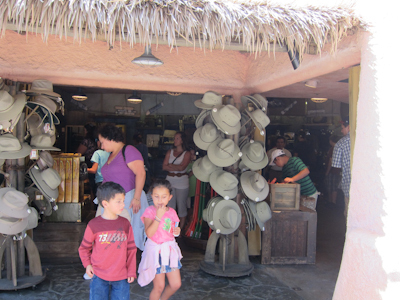 ThinkGeek is definitely right about different hats being used because one you step into the Outpost, on the back wall there are different hats than the one on the hat tree at the entrance. These are, like, a darker green maybe? If you have a child who wants an Indy hat, don’t despair! 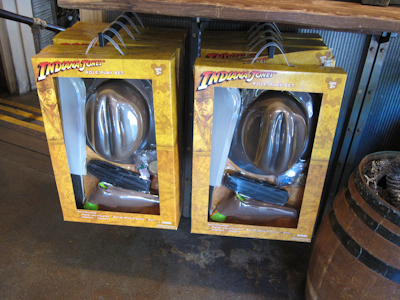 The Outpost has an entire Indy set for your young archeologist. Did you know that the American Film Institute rated Indiana Jones #2 in the Greatest Screen Characters (hero category)? I was a little taken aback by that. I mean, I love Indy and all, but number 2? And lucky Harrison Ford shows up again at #14 for Han Solo. The list is kind of wacky, actually, including Lassie (#39), Marge Gunderson from Fargo (#33), and “Juror #8” from 12 Angry Men (#28, played by Henry Fonda in case you’re not up on your 12 Angry Jurors). #1 is Atticus Finch. That one I have to agree with. Of course, Digory’s middle name is Atticus, and our dearly beloved late Scout Dog was of course named after Scout Finch herself. How far off the track have I gotten from Disneyland? Very far. 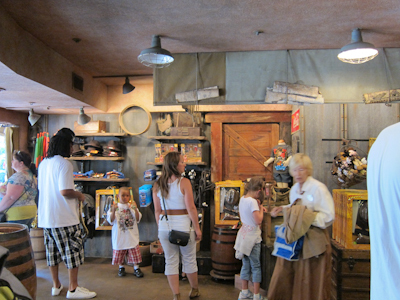 So go see the Indiana Jones Adventure Outpost. If you want a fedora. There was a brief live-action show in that bottle-necked area for Indy, and I think they used those upstairs “apartments” for the show. It only lasted part of a summer before they dumped it since that area is already crowded enough without having people stop to watch a show with Indy Jones battling the bad guys. I Love love love this store. My one souvenier from Disneyland five years ago is an amazing necklace from this shop that I wear with EVERYTHING! I love it. What happened to South Seas? It is still between the Bazaar and Indy’s right? I started playing pinball in that store once and a small crowd formed. It was fun, though there was a lot of pressure not to mess up! Was the Indiana Jones pinball machine not there when you took these pictures? It’s a beautiful table, but was gone for a while.